It’s a common progression of the wedding-planning process. At some point—typically one involving paper stocks or napkin fabrics—many couples remark that they could really use a drink. 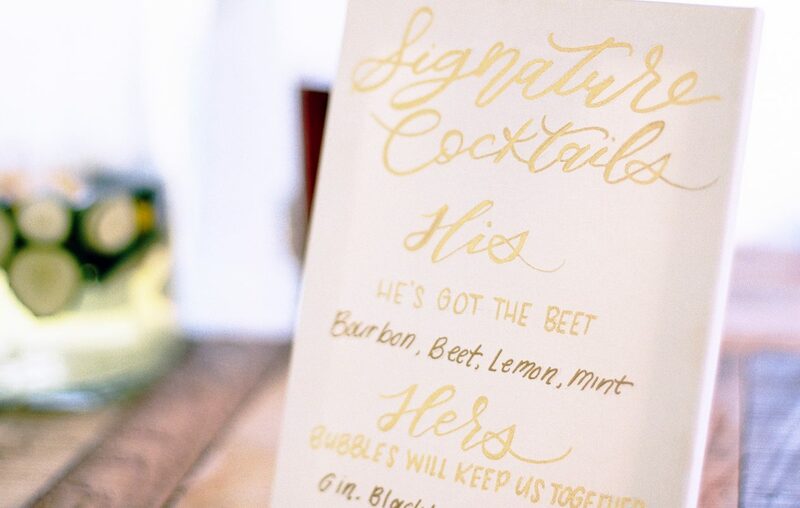 And that’s the perfect moment to consider one of the hottest trends in U.S. weddings: signature wedding cocktails. “We’re seeing that signature cocktails are as ubiquitous as a wedding hashtag these days,” says Alyssa Longobucco, Style and Planning Editor at The Knot. In the website’s 2017 Real Weddings Survey, 23 percent of the 13,000 wedding couples surveyed said they offered their guests a special celebratory concoction—and the figure continues to rise year after year. Why? Guests “get a peek into the couple’s personality,” Longobucco says. Plus, it’s a budget-friendly way to add a touch of top-shelf style to festivities—especially if an open bar will use well drinks or a couple wants to otherwise limit their bar to beer and wine. For couples getting married in Western New York, or those with roots in the area getting married elsewhere, this also provides a chance to add some local flavor to the revelry. And those couples certainly have options: The Greater Buffalo and Niagara landscape is now liberally dotted with breweries, distilleries and wineries, longtime establishments and newcomers alike. We’ve asked four of the area’s standout spots to craft signature cocktail options that not only showcase their products but are also easy enough to work for a crowd. The results not only provide locally inspired options for every season, but also every kind of wedding couple. Cheers! Perfect for: Couples who want to add a little sparkle and bubble to an elegant soirée. Why it works: Meet spring in a glass. The bright, fresh flavors of an easy-to-make grapefruit simple syrup awakens the senses—and play beautifully with sparkling wine and Tommyrotter’s small-batch gin. This is an especially inspired option for people who love classic cocktails like the French 75, but want to add a unique and memorable angle for their wedding celebration. Using a vegetable peeler, remove wide strips of the grapefruit zest and some of the white pith from the grapefruit. Set aside. Add sugar and water to a small saucepan. Bring to a boil, swirling constantly until sugar dissolves. Remove saucepan from heat. Add grapefruit zest and push down to submerge. Let this sit for 30 minutes. Strain mixture through a fine-mesh sieve into a measuring cup or a small jar. Set aside or store for later. Combine gin, lemon juice, tarragon and ½ oz. grapefruit simple syrup in a cocktail shaker. Fill shaker with ice. Cover and shake vigorously until the outside of the shaker is very cold (about 20 seconds). Strain cocktail into an old-fashioned or rocks glass filled with ice. Top off with sparkling wine, garnish with grapefruit wedge, and enjoy. Perfect for: Couples who want an easy cocktail that makes a big impression. “Customized cocktails have become increasingly popular, but customized beer cocktails are just starting to pop up, so it could really allow them to stand out,” Brown says. Boil water. Remove water from heat, add sugar and steep tea bags per brewing instructions. While tea is steeping, add orange zest, vanilla bean and fresh mint. Add a bit at a time, until it hits your preferred level of flavor. Strain tea and chill until cool. Combine one part iced tea with one part Slice O’Havens. Serve ice cold, garnished with mint. Optional Alteration: Combine Fuzzy Navel Wheat (an orange and peach American wheat) with sweetened iced orange pekoe tea. Garnish with roasted peaches. Why it works: This make-ahead sangria is incredibly convenient, and the recipe can be scaled up or down, depending on the size of your guest list. The flavors of the punch celebrate a Western New York autumn—and while they can be tailored to a couple’s favorite apple variety, Susice prefers using ginger golds during September and October. Add apples and peaches to a large pitcher. Using a wooden spoon, lightly muddle the fruit together until it begins to release juices. Add mint, vanilla extract and wine. Stir well. Refrigerate at least 24 hours before serving. Serve chilled. To add a bit of bubble, add sparkling or seltzer water before serving. Optional Alteration: To punch up the flavor intensity, puree the apples and peaches in food processor, then pour into a pitcher. Add mint and wine and then refrigerate at least 24 hours. Then pour it into a new pitcher or punch bowl (strain or remove all the fruit bits) and serve chilled. Perfect for: A couple that’s “a bit dandy, a bit willing to have some fun,” says Bakos. “Not afraid of something with big and bold flavors, but willing to try things.” An appreciation for the cocktail’s namesake author, Oscar Wilde, adds an extra touch of cheeky fun to the experience. Why it works: The use of apple brandy makes the Wilde O stand out from whiskey or bourbon, and the inclusion of ginger syrup adds a touch of spice that will keep guests feeling warm and cozy during the wintertime months. The cocktail also includes the unique inclusion of absinthe—not only does it add a touch of extra elegance, it serves as a nod to Wilde’s love of the spirit. Pour apple brandy into a mixing glass filled with ice. Add lime juice, ginger simple syrup and soda. Stir vigorously until chilled. Strain into a stemmed glass. Top with an absinthe float and garnish with a luxardo cherry before serving.